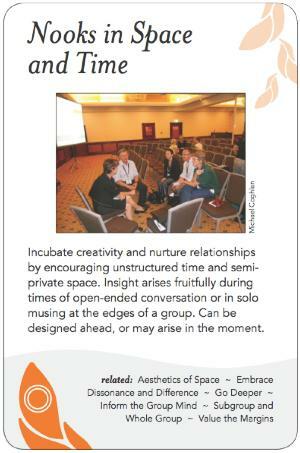 Incubate creativity and nurture relationships by encouraging unstructured time and semi-private space. Insight arises fruitfully during times of open-ended conversation or in solo musing at the edges of a group. Can be designed ahead, or may arise in the moment. Nooks capture energy in more places and times, like the crenelated folds and cilia in some body organs. Open Space is built around this idea of offering varying sizes and configurations of time and space. Margins are where the creative "edgy" work of individuals and groups gets done. Nooks can be organized, and/or can be self-organized. Nooks are the time and space for meaning to be made -- for Harvesting (creating useful artifacts and creating Feedback loops that then feed back into the system). They allow us to be in diverse emotional spaces without leaving the whole group, and enable the need to retreat, to be private. They allow people who want to go off and do their own thing, the space for the Law of Two Feet. The butterfly role in the Law of Two Feet (the lurker on the edges -- Harrison Owen's own invention) - creates nooks. Butterflies "preserve the coffee break" even in dynamic formats like Open Space that allow a lot of freedom for such things. Co-housing is a living example of provision of such nooks. Likewise some mixed public/private spaces in Europe. Metaphors: The Navajo pattern - space in the interval of triangles in their blanket designs. Alexander's alcoves. Private country clubs -- the way "white guys in golf carts" create their nooks. Don't get in the way or squelch nooks. Make sure there are places to go while still being "contained", held in the broader space. Don't time-constrain the agenda -- allow time to breathe between agenda items. Both the time and space should be bigger than the formal agenda requires. Nooks are where relationships are created. Without them the facilitator becomes too central/important. Don't try to over-organize the nooks. Don't constrain how/when they are used (e.g. don't choke off personal deal-making that happens in the nooks), allow them to be used for what people want. Chris Corrigan worked with a conflicted Native community that did not have enough work or competencies to sustain itself. 20 contractors he was facilitating needed to figure out how to share the work that was available. An open reception area was employed, along with offices with glass walls used as breakout sessions. You could see but not hear what was happening in each. Previously, square tables were used in a finite space. When people were unhappy they would pound on the table, leaving the room and sometimes even the entire building. Now, with no tables to pound on, people would instead leave the breakout spaces and go to the main room, which was used for coffee and allowed cooling off without leaving the whole building/event. Once cooled off, people would then rejoin the group. Chris also facilitated a 1500 person Open Space -- some members created a separate dialogue space in a small room with papered walls for drawing on. There were no specified times for this space to be used, which gave people time for reflection and small-group discussion between 'scheduled' activities. A huge amount of creative work happened in this 'unscheduled' space. Alexander's alcoves are the physical analogue -- they allow intimacy of small groups within the whole. Dave Pollard has often been at large conferences with many scheduled back-to-back presentations with no provision for small group and personal space and time. The group invariably and aggressively creates its own space in the corridors and opts out of time-constrained sessions.